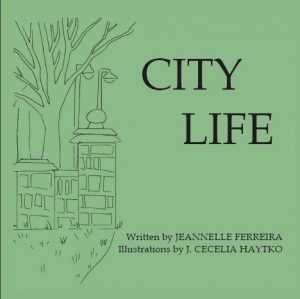 As city dwellers ourselves, this book really resonated with us. So many children’s books are about farming or other things that are just not a part of our lives. Our daughter loves this book because it features two moms, which is like her family, but also because she recognizes all of the images in the book. We take buses and trains, we go to museums, and we walk to the farmers market. The text of the book is simple and the illustrations are unique. The pages with text feature large black text on bold colors (orange and green mostly) and the facing pages feature simple hand drawn black and white drawings. Because we like this book so much, we will keep it in our collection, though we find the references to animals in captivity to be quite unfortunate. I think my kiddo would have liked this when she was younger too. When we lived in Brooklyn, her life revolved around the local playground, subway rides into Manhattan (sometimes for vegan ice cream! ), and urban wildlife like pigeons and squirrels. Thank you so much for the review! I appreciate your point about the zoo/aquarium. I was basing the narrative on what I liked to do in Boston as a child, but I think your review brings up a good point: awareness levels have changed, and animals belong in the wild. Thanks for writing this book! It’s really great.